Cough is an infection of the upper respiratory tract can cause swelling and irritation of the upper airways. Although, it is a common health problem in everyone but not serious if ends in a week or 10 days. Cough occurs when there is a blockage or irritation in your throat or upper air passages. It is because of common cold, flu, viral infections, smoking or other health problems. Itchy throat, chest pain, sore throat, congestion, feverish is some of the symptoms of cough which will irritate you. Generally, they are two types of coughs, first one is wet or productive cough which yields mucus and is caused by cold, allergies and other respiratory problems. Second one is dry or unproductive cough which is caused by cold, cigarette smoke, dust, fumes and other forms of irritation. 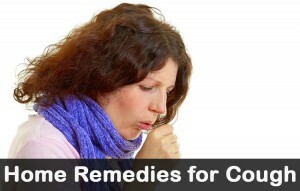 Here, both remedies for both the types of cough are mentioned. Go for these natural homemade remedies which cures your cough naturally rather than over the counter medicines & syrups which causes harm to your body & brain. Home remedies are simple & effective treatments which can cure the problem without any side effects to your body & mind. So, go for these natural remedies to cure your cough. Salt water helps to draw the excess fluids from the inflamed areas in the throat to reduce the cough. Gargling helps to remove irritants in the throat and thins the mucus. It has both antibacterial & antimicrobial components which help to treat cough. Honey will soothe the irritation. This process will help you in breathing & reduces the cough symptoms. Or you can simply take garlic in your cooking. It helps to alleviate cough & soothe your throat. It can desensitize the tickling and reduce the coughing. It reduces the chest pain caused by continuous coughing. Drink this syrup two to three times a day to get relief from the cough. Do this regularly until you get rid of the cough. Carrots are rich in vitamins and nutrients which help to build immunity to prevent from the cold, cough. Take it regularly until you get relief from the cough and its symptoms. Drink it for three times a day to get relief from chronic cough. Now drink this herbal solution for 3 – 4 times a day. It will give relief from the sore throat, coughing as well as congestion. It reduces the cough and its symptoms. Drink it slowly & regularly. Butter soothes your throat, honey is a cough suppressant and vinegar is an antiseptic. All this works well to get relief from the cough. Mustard Seeds contain Sulfur which stimulates the flow of mucus. It helps to get wet cough. Then drink this solution, which will give your relief from the pain. Pepper is very helpful to those who suffer from cough due to thick mucus. It helps to stimulate the circulation and flow of mucus in the airways. Thyme & Peppermint has antimicrobial and antispasmodic properties to get relief from hacking cough. Both these will help to clear the congested air passages. Mullein and licorice will soothe irritation of membranes and thus reduces the inflammation. Take 1 teaspoon whenever get cough which helps to get relief from the cough. Store the remaining in a container and put it in the refrigerator. Repeat the process whenever you have cough. Strain the tea to drink slowly. Take this tea whenever necessary and not to stop until the cough goes away from you. Marshmallow leaves yield a gooey mucilage which coats your throat and thins mucus in the lungs, making it easier to cough and also reduces the congestion. Take this cup of tea for 3 times a day to get rid of the congestion and cough. Flax seeds give a thick, gooey gel that soothes your throat when boiled in water. Honey and lemon acts as mild antibiotics. Steps are given below to make this syrup. Take a tablespoon as you get the cough. Follow taking this syrup until you get rid of the cough. Almonds have the property which gives relief from bronchial problems including cough. Take it regularly (but not too many), as it have nutritional properties which plays a proactive role to prevent the cough. Take this paste freshly until you get relief from the cough and its symptoms. Then add honey and drink this solution 2 – 3 times a day. Drink it twice a day to get relief. Drink this daily to get instant relief. Peppermint is having the property of reducing the congestion and cough. Mix it well and drink this liquid which helps to calm your cough. But make sure that not to use more than 6 drops for adults and don’t use this oil for children. Both Honey and Cinnamon acts as anti-bacterial and anti-viral which cures the infection causing cough. Honey will coats and soothes the throat. Then take a spoonful as required to quite your cough. Follow these tips which are very helpful in curing cough. Chicken Soup which is hot and tasty will helps to cure cough and its symptoms better than over the counter medicines. Acupuncture cures all types of cough. Taking Acupuncture treatment will gives relief from the cough instantly. Nux Vomica and Belladonna are both regularly prescribed treatments in Homeopathy for cough. Through medication, yoga you can prevent the cough. This will helps to reduce the stress at last it gives relief from the cough. Stream vapors, menthol vapors will help to give relief from the cold, cough, sore throat. Use humidifier to get rid of the dry cough by moistening the air wherever possible like home, office. Frequently have some candies which increase the saliva and reduce the irritation as well as cough. Hydrating yourself will also help to prevent you from cough. So, drink water and other fluids (Fruit juices) but don’t take citrus fruits which cause irritation to your throat. Take a bittersweet horehound and aniseed cough mixture which helps to prevent cough, it is available in drug stores / pharmacies. Take a gelatin packet and pour it in boiling water. Drink this when it is still liquid and warm. Drink a cup of hot milk sweetened with honey daily to prevent cough. Grapes help a lot in relieving you from cough as it acts as an expectorant and releases the mucus from the affected parts of the respiratory system and at last relief from the cough. Grape juice with honey is more effective. Try head off a coughing fit, i.e., force yourself to take a series of small, gentle coughs and finally ending with a large one. This tiny coughs helps to move the mucus towards the upper part of air passages so you can expel more of it in the last cough. Generally cough will be cleared within a week or 10 days. If you have cough more than 2 weeks, or if you have cough with blood then immediately call to the doctor and take the treatment to it as it may be dangerous. Take hot liquids frequently like hot tea, coffee, milk or other which you take it as hot. Take Elderberry Syrup will help to give relief. Go for herbal cough syrups rather than over the counter medicines/syrups. Go for a steam to get relief from the mucus of the cold, cough, sore throat. Trying these natural remedies will definitely cures your cough and its symptoms within 2 weeks. If it’s not cured, immediately consult the doctor for medication, as it can lead to any serious problem. Are you seeking home remedies for toddler cough? Check it out in our separate post!